At sea, on the battlefield or deployed for network redundancy, satellite networks with Uplogix out-of-band connect all corners of the world. Uplogix brings a variety of specialized features to the satellite arena in both fixed (autoacquire) antennas and the stabilized antennas common in maritime applications. Both types of deployments benefit from the fact that Uplogix is local and connected directly to the network and communications devices common with satellite-enabled locations. Secure and persistent out-of-band access to remote devices | When the network is up and running, admins access devices through Uplogix over the network. If that connection is broken or not yet established, an out-of-band connection is established providing a two-way, secure management link independent of the primary network. Automated device control and recovery | Uplogix monitors devices 24×7 over the console port and takes recovery steps when issues are detected. 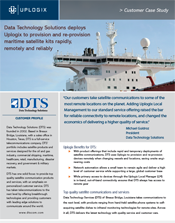 CASE STUDY | With product offerings that include rapid and temporary deployments of satellite communications, DTS uses Uplogix to provision and re-provision devices remotely when changing vessels and locations, saving onsite engineering costs and speeding rollout. Our customers take satellite communications to some of the most remote locations on the planet. Adding Uplogix Local Management to our standard service offering raised the bar for reliable connectivity to remote locations, and changed the economics of delivering a higher quality of service. Uplogix Local Managers (LMs) serve as on-site, virtual network assistants deploying in teleports and POP locations to manage internal infrastructure, as well as at end-customer locations to automate problem diagnosis and recovery, perform routine network maintenance and configuration, and ensure network availability, even when the primary connection is down. If a main broadband satellite link goes down due to mis-configuration or other unforeseen circumstances, the LM at the disconnected remote location automatically dials out to a low earth orbit (LEO) satellite via an integrated external modem to re-establish an alternate, out-of-band network connection to ensure constant management connectivity and availability. The Uplogix Control Center centrally manages all satellite and terrestrial network equipment from a single screen via the web-based portal. From the Control Center, administrators can schedule and coordinate all network maintenance and management operations. In addition, the Control Center serves as the central repository and reporting interface for all data collection and audit logs provided by the appliances deployed at satellite-linked locations. 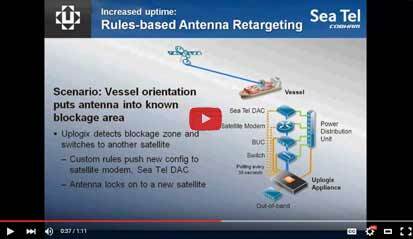 Automated recovery from a blockage zone: When a vessel enters a known blockage zone Uplogix can retarget a satellite antenna to another satellite. 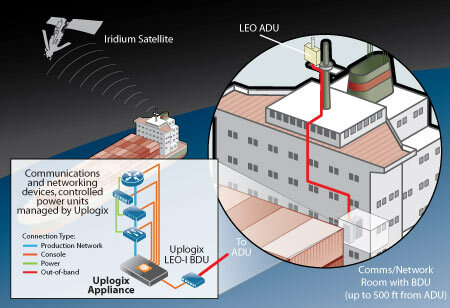 Uplogix Local Managers (LMs) utilize the reliability of the Iridium system of low-earth orbiting (LEO) satellites to provide out-of-band (OOB) connectivity to remote networks. With Iridium’s coverage of the entire Earth, including oceans and the poles, Uplogix can deploy anywhere, providing constant connectivity and the power of the most trusted IT admin everywhere, all the time. To ensure the best Iridium signal for OOB, Uplogix developed the Uplogix LEO-I kit. The LEO kit makes it possible to place an Iridium antenna and modem at an optimal location for a clean, strong signal – up to 500 feet from the networking gear and Uplogix LM that it is supporting. The kit consists of two components: an above deck unit (ADU) and a below deck unit (BDU). The ADU integrates GPS and Iridium antennas with an Iridium modem in a stainless steel housing. Also in the ADU is an RS422 converter that transmits over standard Cat5 cable to the BDU. The BDU has connections for power and a port adapter to connect as the OOB modem for Uplogix. 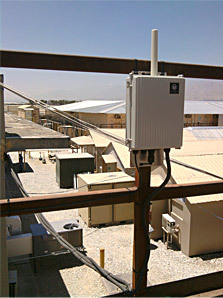 The Uplogix LEO-I Kit deployed on a rooftop at a military base in Afghanistan. Iridium communications rely on line-of-sight with one of the 66 LEO satellites, so antenna placement is critical. Also important is a clear signal between antenna and the Iridium modem, which Uplogix achieved by minimizing the distance between them through the integration in the ADU. In this illustration above of a maritime deployment, the ADU is placed at a location with maximum view of the sky and limited obstructions. Other uses of the Uplogix LEO kit include locations where buildings or terrain might impede clear view of the Iridium constellation of satellites. Built on a secure platform, Uplogix gives you eyes and ears on your gear whether the network is up or down.